Place this fountain anywhere for an instant feng shui sanctuary! Cascading water provides soothing music as it flows from beneath a laughing Buddha figurine to tumble upon the river rocks below. The faux-stone finish is timelessly elegant. Relax to the soft sounds of trickling water. It will soothe your mind, body and spirit, leaving you calm and rejuvenated. This magnificent indoor fountain, with its beautifully detailed design, is constructed from strong, yet lightweight materials and finished off with a natural weathered stone look. Achieve the look of class and enhance the decor of your home or office. This 8.5-inch high fountain will look great on any table, shelf, desk or dresser. Use it to enhance and calm any indoor space. It includes the pump and everything else you need. A long lead and standard three-prong cord allow you to plug this fountain in anywhere. Lightweight, yet sturdy fiberglass constructions gives this fountain the look of natural stone without the cost or weight. Because this item is made to order and hand-finished, color may vary slightly. Order Yours Today! PLEASE NOTE: This item Ships via UPS Ground. Please allow up to 10 days for delivery. 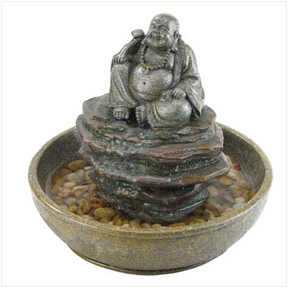 The Buddha Table Top Fountain - Perfect for any indoor space. This uniquely styled fountain will enhance the decor of any home or office. Lightweight materials and a small footprint make it easy to place it almost anywhere. Order Yours Today! Add Humidity, Diffuse Fragrance, Purify The Air, And Enjoy The Mood Lighting And Natural Water Sounds. 100% Pure. A powerfully floral scent. Sweet and seductive, it's the perfect fragrance to set the mood. 100% Pure. A crisp and invigorating scent. Sharpen your mind, relieve headaches and more with this fresh citrus fragrance. A classic scent with a wide range of therapeutic benefits. Improve the smell of your space while relieving stress, reducing pain, and boosting your immune system.